Summer’s coming to an end and alas I didn’t get my tropical vacation this year. I have a couple of other small trips coming up that prevented us from adding in a Hawaii getaway. Maybe that’s why I found myself craving something sweet and fruity and faintly exotic, that could make me feel like I’d managed a beach escape. This guava, mango, and passion fruit cake combines three of my favorite fruits into a triple-tropical confection. Together, the layers form a beautiful rainbow medley, from dusky pink to sunset orange to vibrant yellow. These lush, colorful fruits bursting with juice when ripe are one of my favorite things about going somewhere warm for vacation. Whenever I’m in Hawaii or southeast Asia, I can’t get enough of all the passion fruit flavored sweets, guava ice cream, or just eating fresh mango off the side of the road. This cake is partially inspired by the famous Hawaiian Paradise Cake from King’s Hawaiian Bakery. 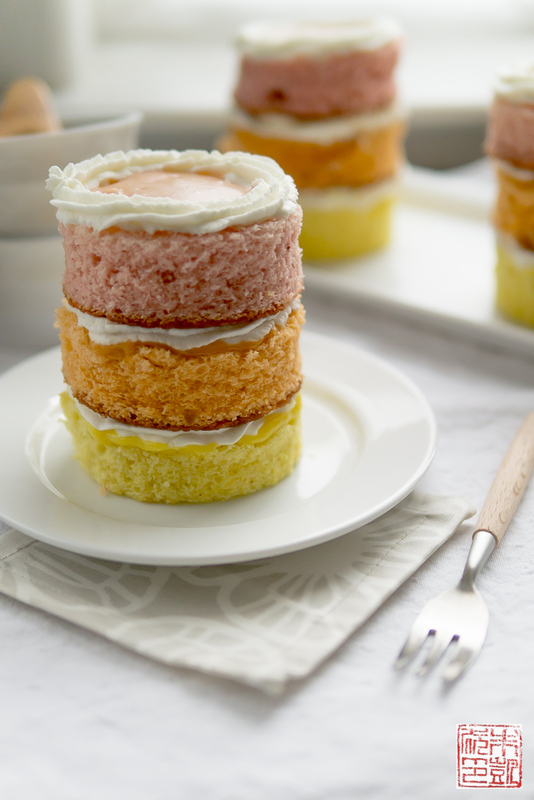 Made of layers of guava, passion fruit, and lime chiffon cake filled with whipped cream and topped with a similar rainbow of glazes, it might be one of the first rainbow-colored cakes around. However, in looking up the Hawaiian Paradise cake I noticed the chiffon cake recipe differed slightly from the traditional American chiffon cake recipe I typically use. I didn’t test out that recipe to see the difference in results, but just know that this recipe is based off an American-style chiffon cake, the kind you often see made in tube pans. Although I’ve heard concerns about baking a chiffon cake in a regular cake pan with a tube in the center, I didn’t have any problem with this cake. I think that splitting it among three pans gives the batter enough space to rise without being weighed down. If you try to bake this entire in one pan, I would probably suggest using a tube pan to make sure the entire cake can rise properly. Each of the layers uses a different fruit nectar for flavoring: guava, mango, passion fruit. If you can find fruit nectar, it will give a stronger punch of flavor to the cake than juice. You can also use lemon juice along with some zest to make this a lemon chiffon cake – the possibilities are endless! I also made a fruit curd filling as well to enhance the flavor. What’s cake without a filling? 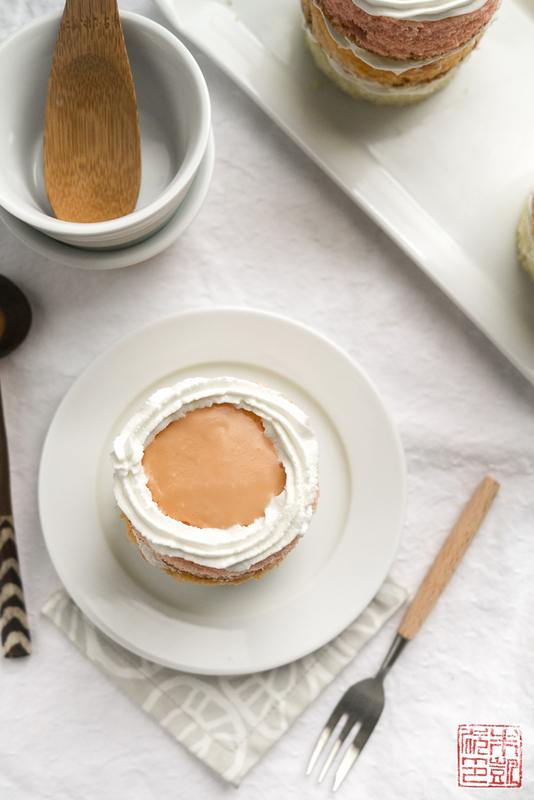 The sweet-tangy curd adds an additional layer of richness and gives the whipped cake something to play off of. Although this cake looks complicated, it can actually be as simple or complex as you’d like to make it. The original idea I had was simply for a tropical fruit-themed cake, so if you want to make a guava-only cake, or mango-only cake, and have all the layers be the same flavor, you can absolutely do that: the recipe below is laid out so you can pick one flavor and make all the components in one go. 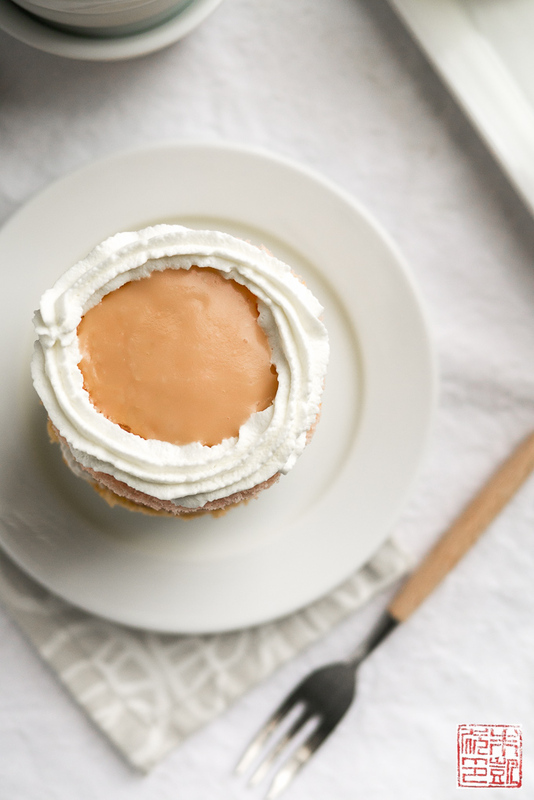 If you don’t want to make mini cakes but just want to use the 9″ round layers straight out of the pan to make one big cake, you can do that too. Both of those variations will save you time in preparation and assembly. If you do go the triple-flavor route, though, it’s simply a matter of being organized and making sure you have enough bowls(!) and laying everything out ahead of time. The steps in the recipe below will tell you where you can divide up the batter and add in the different fruit nectars and colorings to get three different batches. Because this is a chiffon cake that’s dependent on whipped egg whites for lift, you want to get the finished batter in the oven as quickly as possible before the whites start to deflate. This is a really fun cake to see come together; as you balance the layers on top of one another like colorful stacking blocks, it’s like creating an island sunset. It’s light and airy, sweet and tangy, just like how I always picture everything is in paradise. If you’re not quite ready for back-to-school, back-to-work, back-to-reality, just have a little slice of this and dream away! Note: if you want three different flavor fruit curds, divide the amounts below by three and make three batches with the fruit nectars of your choice. Preheat oven to 325 degrees F. Grease the bottoms of three 9" round x 3" high cake pans and line with rounds of parchment. Whisk together one cup of the sugar with the flour, baking powder and salt. In a separate bowl, beat the oil, milk, fruit nectar, egg yolks and vanilla extract until pale yellow. (Note: If you are making three different color layers, you can wait to add the fruit nectar until you have added the dry ingredients. Then divide the mixture into three equal portions and add 2 tablespoons of fruit nectar to each one, and food coloring to match if desired). Add the dry ingredients and beat until well blended. Add in food coloring as desired and beat to combine. In a stand mixer, whip the egg whites on medium-low with the cream of tartar until foamy. Increase speed to high and beat to soft peaks. Gradually add the remaining half cup of the sugar in a slow, steady, stream and continue whipping to glossy, firm peaks. Do not overbeat - you do not want to whip to stiff peaks. Pour the batter into the prepared pans. Bake for 25 to 30 minutes. The tops should rise, turn golden brown, and spring back to the touch when lightly pressed. Avoid opening the oven door unnecessarily as this will make the cakes deflate. Use the oven light and check at 20 minutes for doneness. Remove from oven and let cool on wire rack completely before attempting to unmold. Run a thin, sharp knife around the border of the cake and invert to unmold. Create a water bath by placing a saucepan of water over heat to simmer and placing a metal bowl unto the pan so its bottom does not touch the water. Whisk the eggs, sugar, and fruit nectar or puree together in a metal bowl. Cook the mixture over the simmering water, whisking constantly, until the curd reaches 180 degrees and thickens. Keep whisking while the mixture is heating up to prevent the eggs from cooking. Once the curd is thickened – you should be able to make tracks in the mixture with your whisk – take the curd off the heat. Let the curd rest for a bit until it cools to about 140 degrees. Add in the butter pieces a few at the time and whisk to combine. Pour into a container and chill in refrigerator before using. Level off the cakes with a serrated knife. 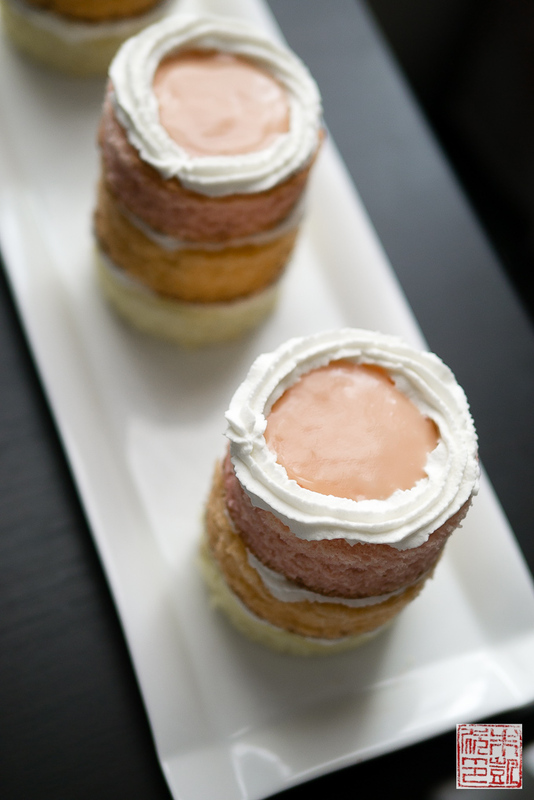 If you are making mini-cakes, use a 3" round biscuit cutter to cut out four rounds from each layer. Place bottom layer on a plate. Spread a layer of fruit curd on top. Pipe a layer of whipped cream over the fruit curd. Place second layer gently over the whipped cream. Spread a layer of fruit curd on top. Pipe a layer of whipped cream over the fruit curd. Repeat with the final layer of cake. Spread a layer of fruit curd on top. Pipe a ring of whipped cream over the top or decorate as you like. What a beautiful and delicious dessert! Reminds me of my Hawaii trip! These look so delicious. I love that each person gets their own little cake! Great idea for my birthday coming up! I know exactly what you mean about not being able to get away this summer… but this dessert looks like paradise in your mouth! I am loving the gradient effect of the yellow/orange/pink layers. So pretty! And with that wonderful combination of fruity flavours, I bet these cakes taste even better than they look. I can just imagine how wonderful this tastes! What a treat. I may or may not have just licked my computer screen. O_O Looks SO good! How beautiful is this cake?! I think this looks so good and not so hard to make! Thank you for sharing! What a gorgeous dessert! Love the fruity flavor combo too! Wow, this looks unreal! Too pretty to eat… maybe! You are amazing Anita! 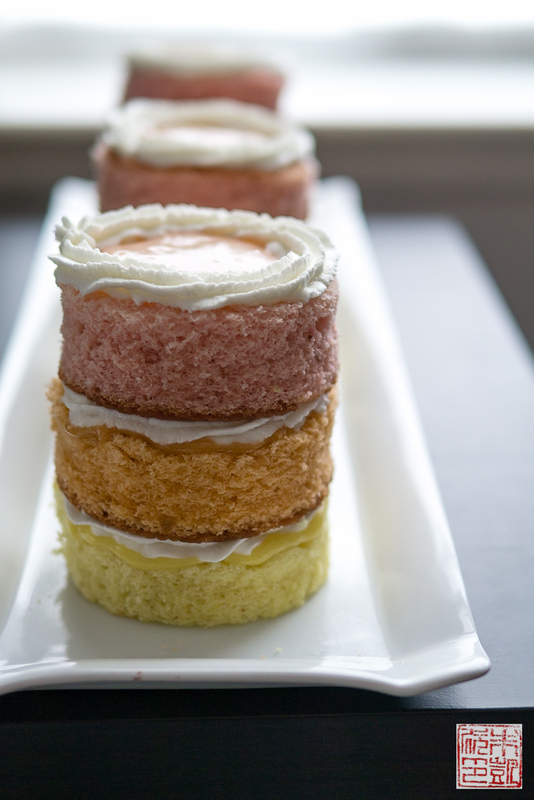 These cakes are beautiful and the flavors are perfect! These are almost too pretty to eat! Almost 🙂 A lovely little tropical treat for those of us who can’t manage a tropical getaway. What a cute, colorful cake! This looks fantastic! These cakes are so pretty and I love that they are little individual cakes to show off those tropical colors. A vacation is always great but when you can’t go away, I like to travel at home with food! These are simply beautiful! Love the idea of the mini-cakes. So impressive! Anita, these cakes are just perfect! Colors and flavors. I wish I could dig into one right now. Oh my gosh, this is incredible! I absolutely adore all of these flavors and the presentation is simply fabulous! What an impressive cake! The layers here are so pretty and I love the flavors too. This is just about the prettiest cake I’ve ever seen! Wouldn’t they be just perfect for a shower or wedding? This is awesome! Now I know what to do with all the passion fruit from my parent’s garden! Looks beautiful and delicious.